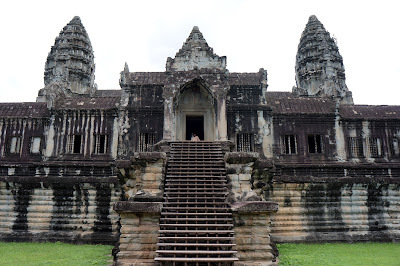 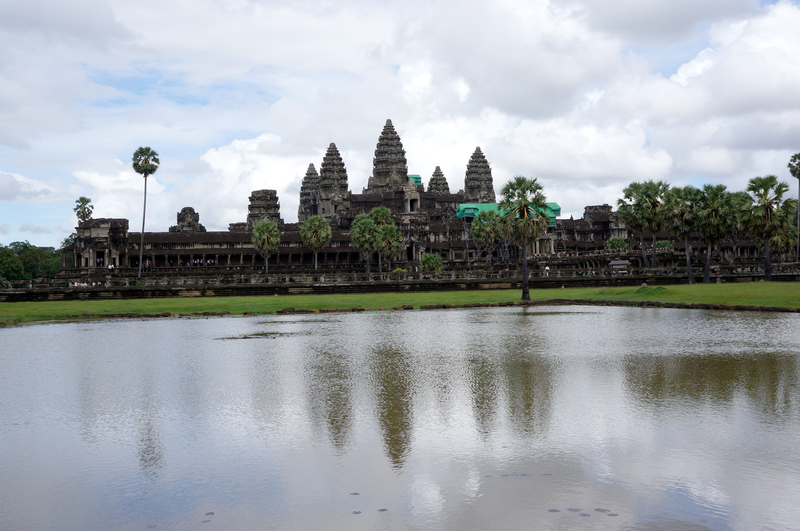 Last stop on our first Angkor Wat, the largest religious building in the world.To get to Angkor Wat you have to walk over the bridge above, which is just stunning. 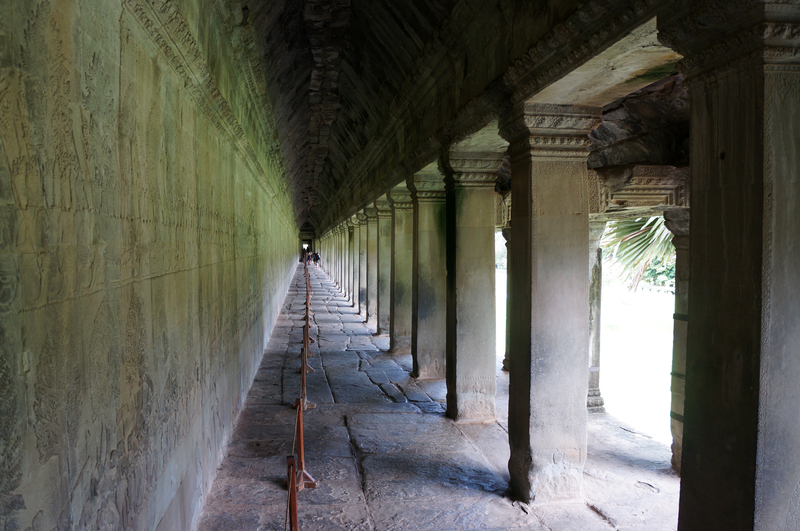 Again, writing about places like these and sharing a handful of snaps can't ever hope to do a place any justice. I can describe the scale, the massive stone structures all perfectly aligned and at right-angles, and the intricate carvings on these stone surfaces, but you can't feel the magic of such a place. 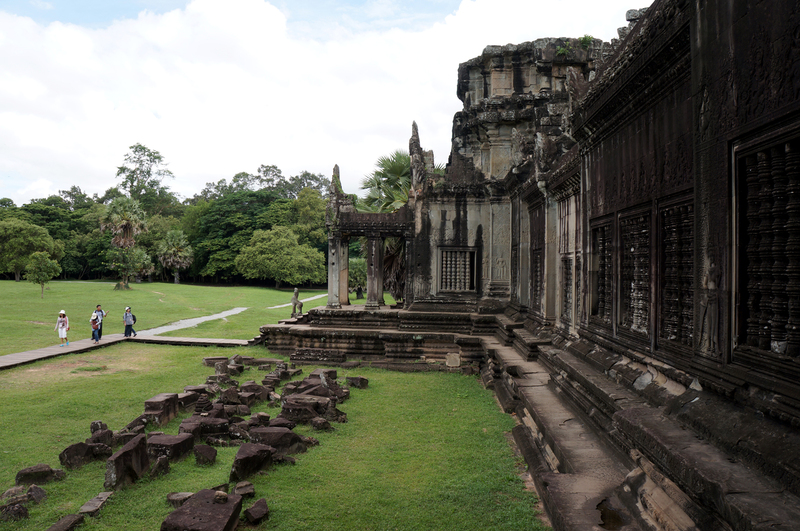 The serene setting, the peacefulness and tranquility that just seems to exude from the site. 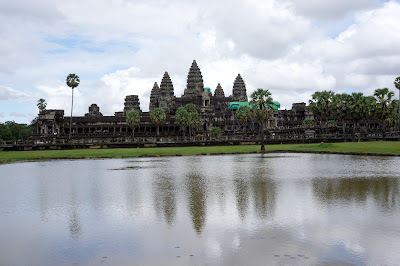 We wondered about, and I snapped the camera about every three seconds, there was just so much beauty. 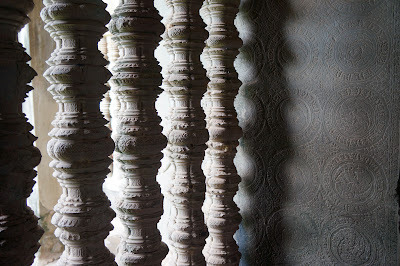 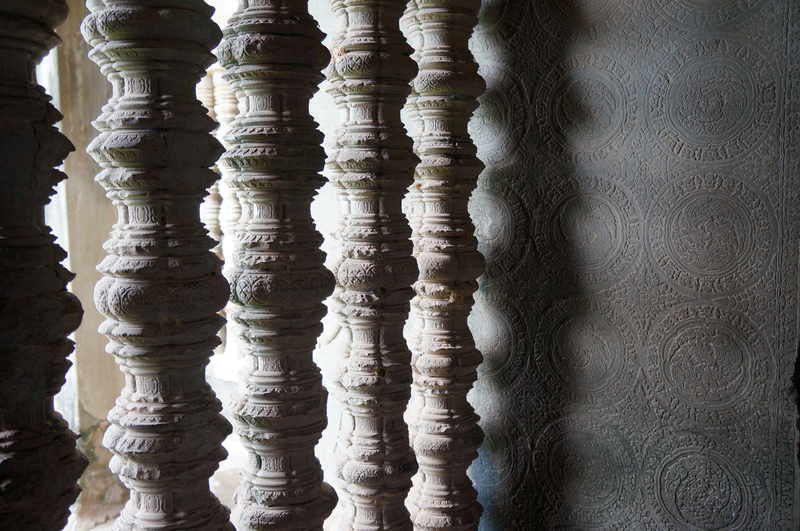 In the surfaces, colours, textures of the temple and then the views from it out to the surrounding landscape. 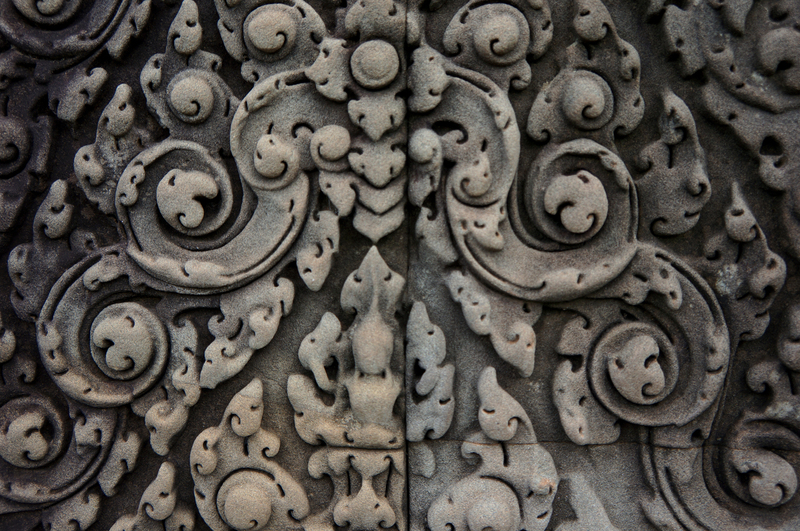 I'm a sucker for a nice piece of craft handywork and the stone carvings were beautiful. 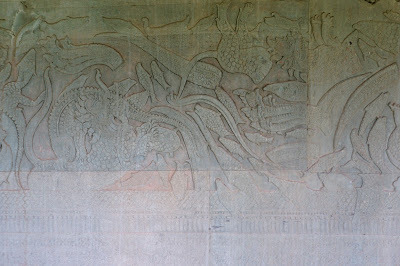 Some had been warn down over time to soft-egde fuzzy versions of their former glory, like the images above. 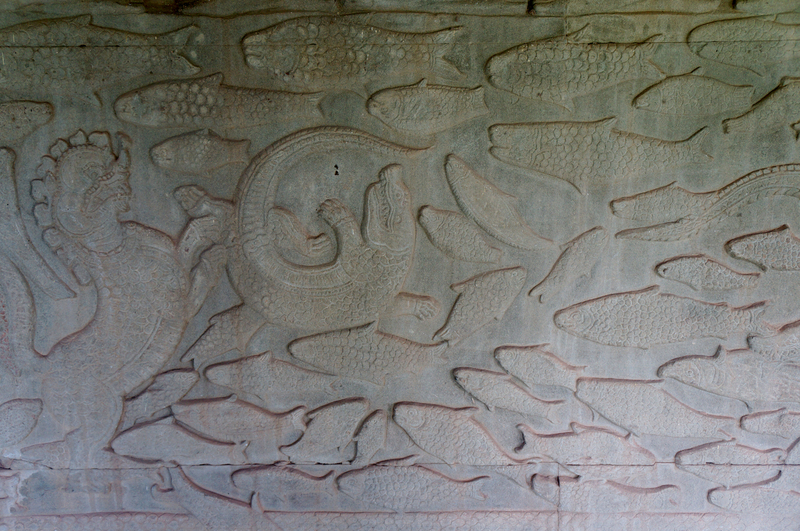 But some carvings sheltered from the elements had been luckier. 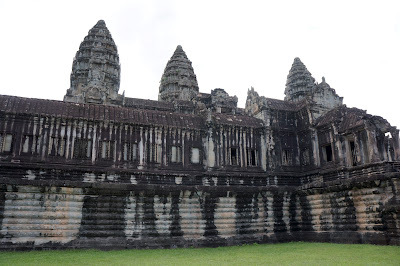 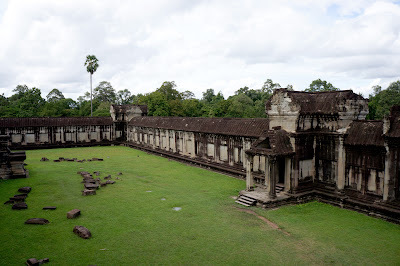 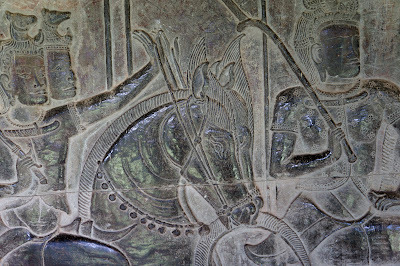 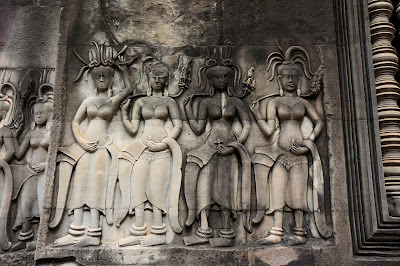 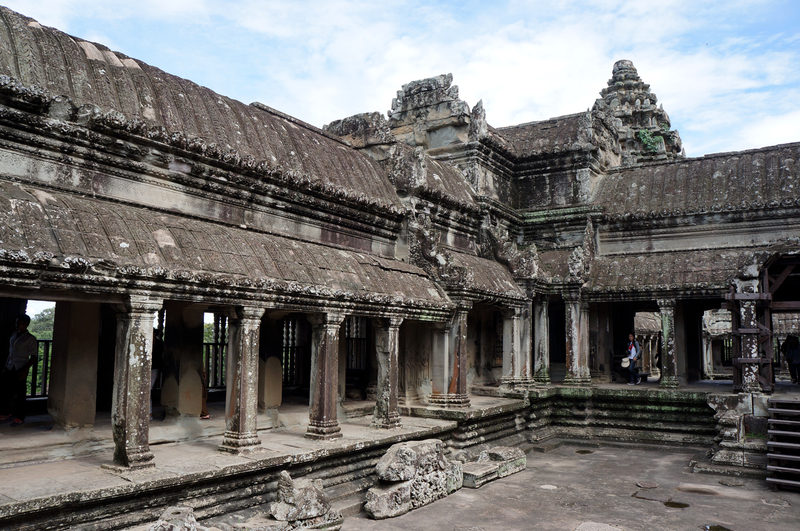 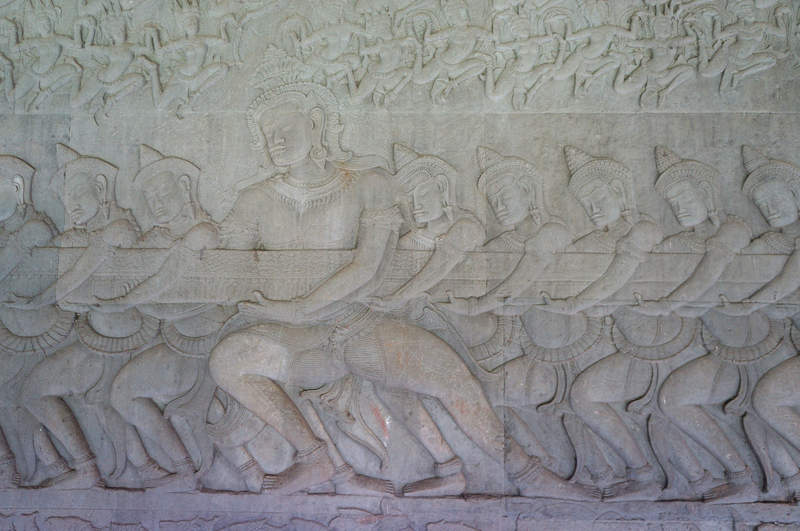 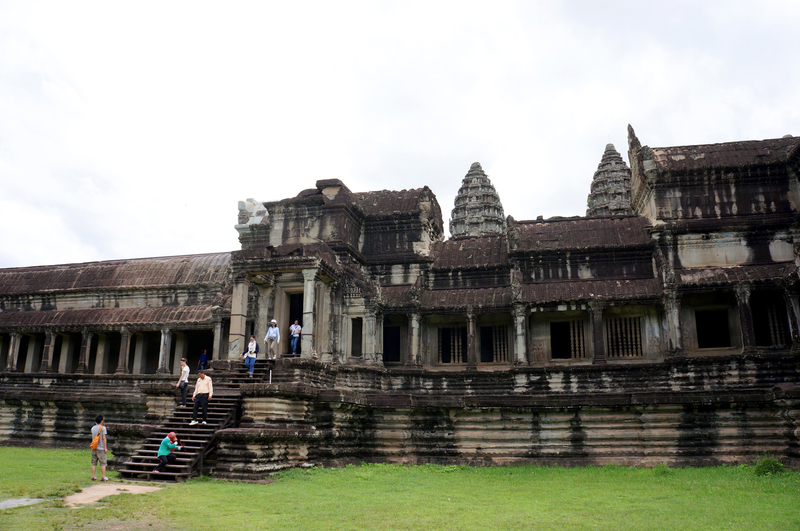 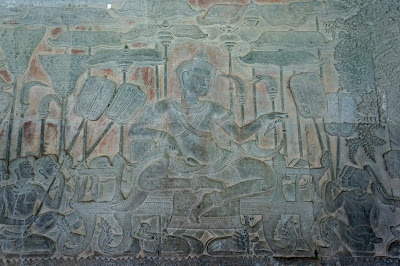 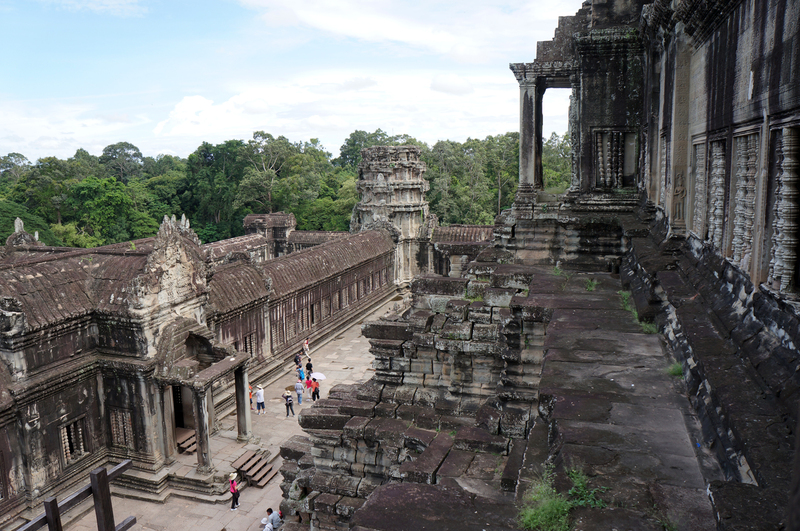 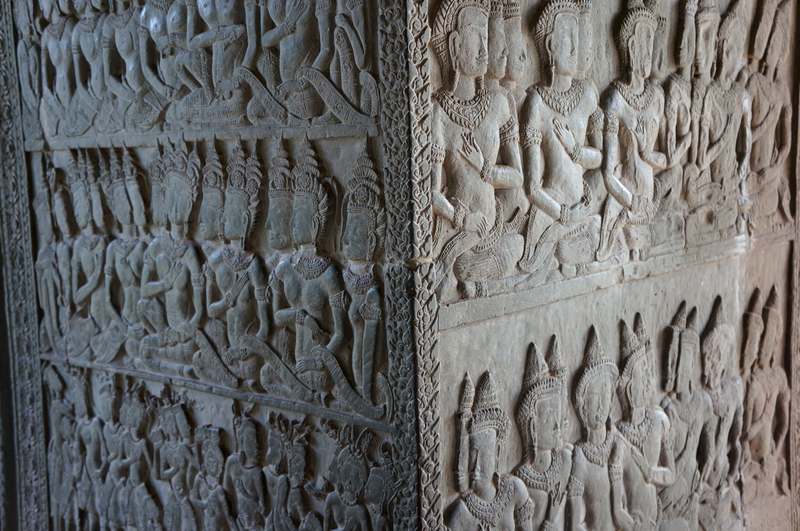 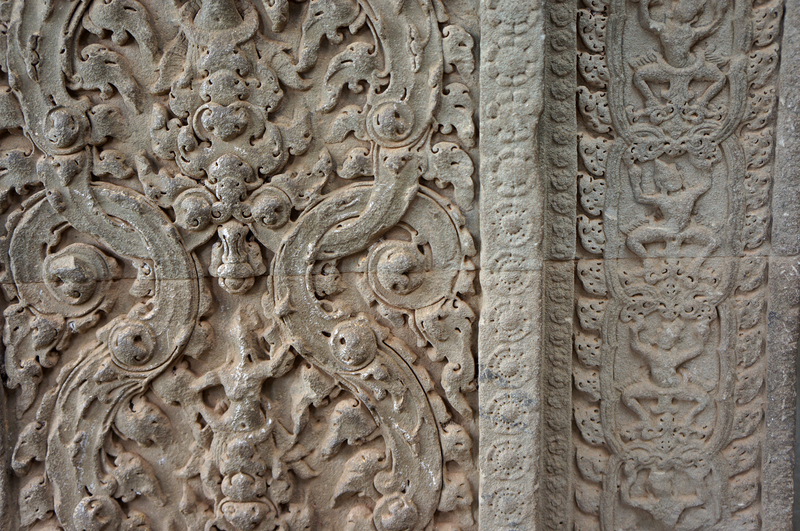 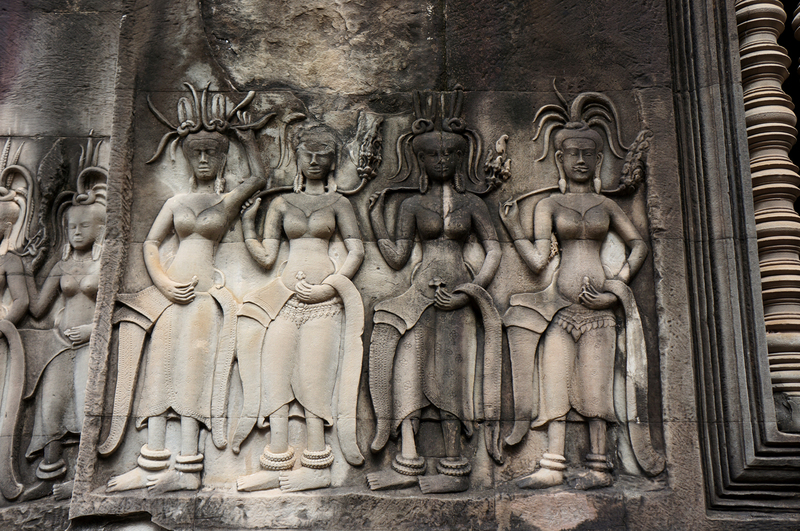 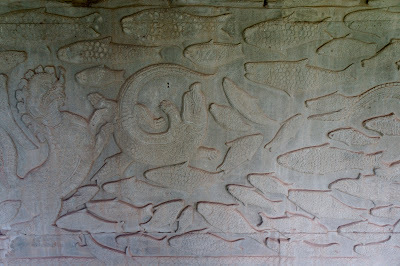 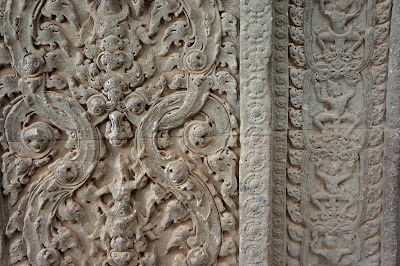 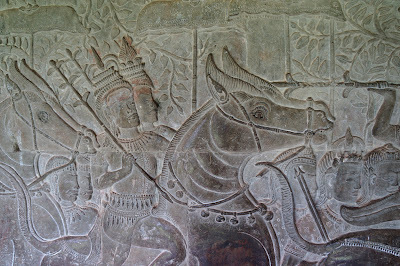 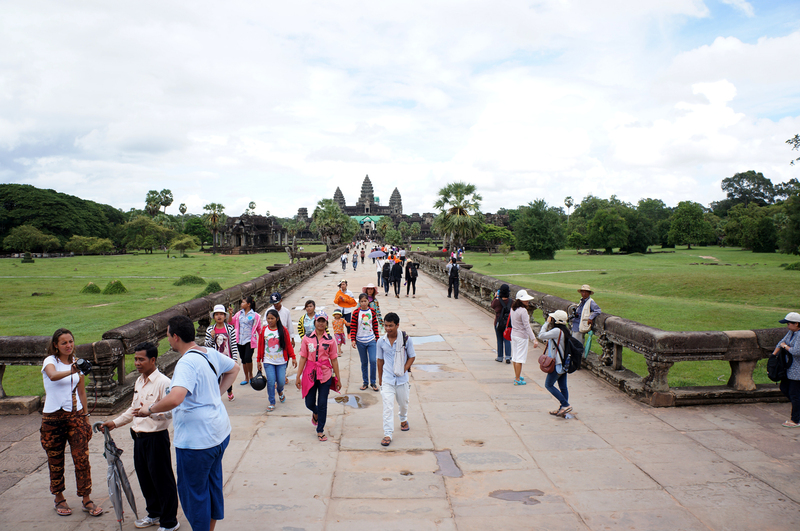 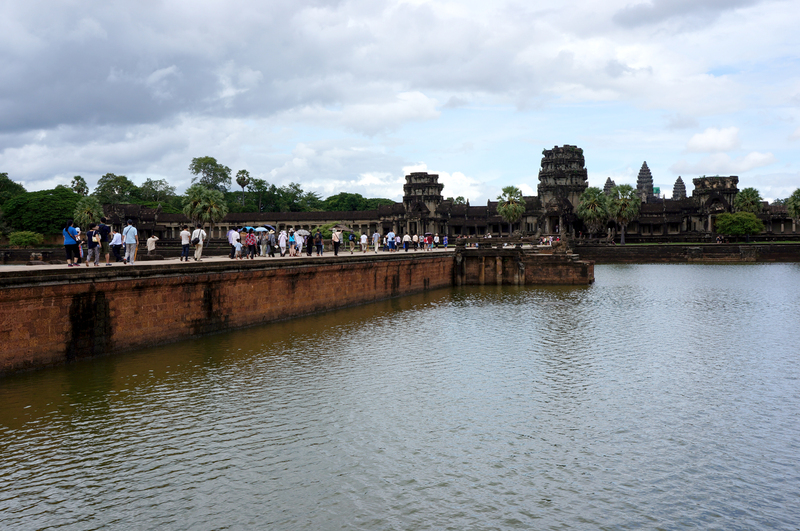 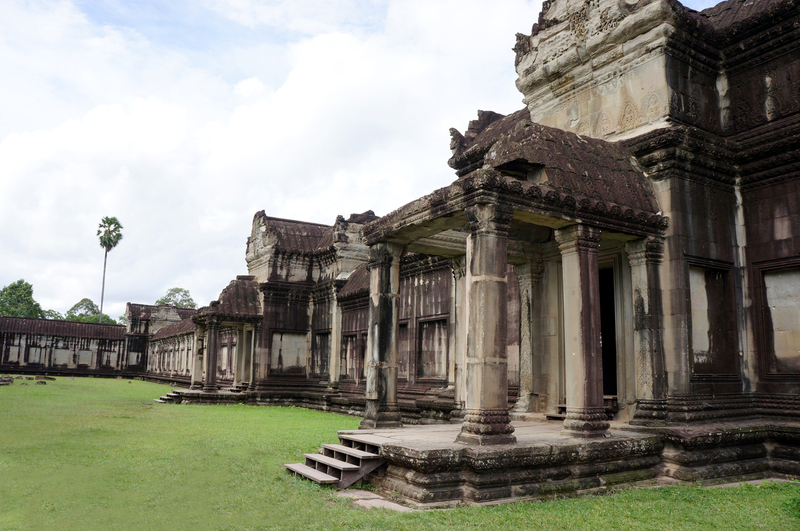 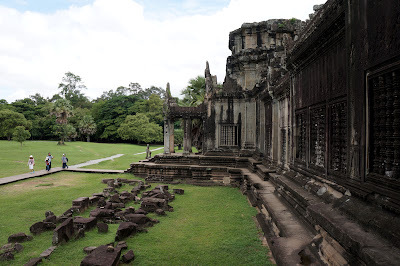 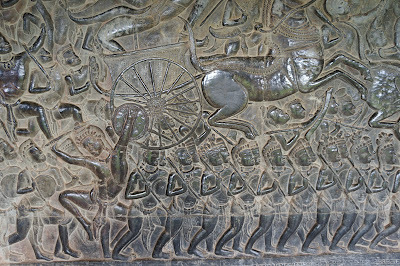 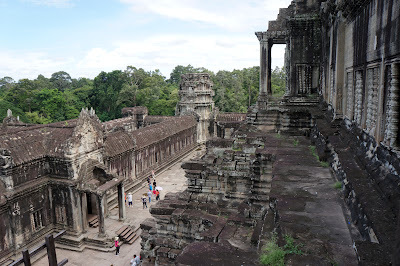 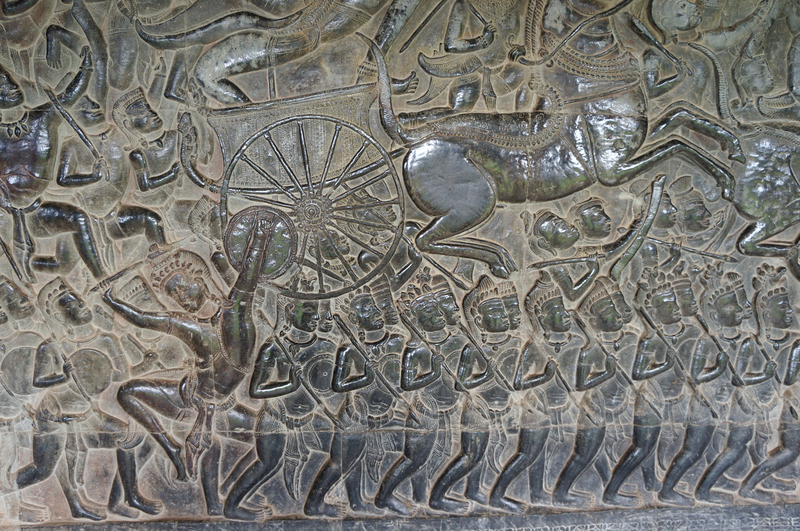 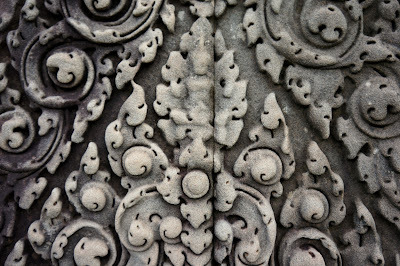 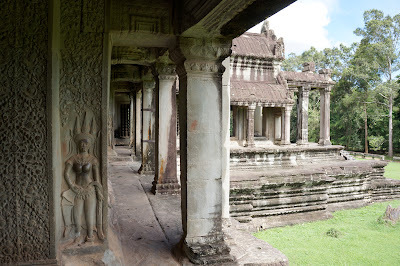 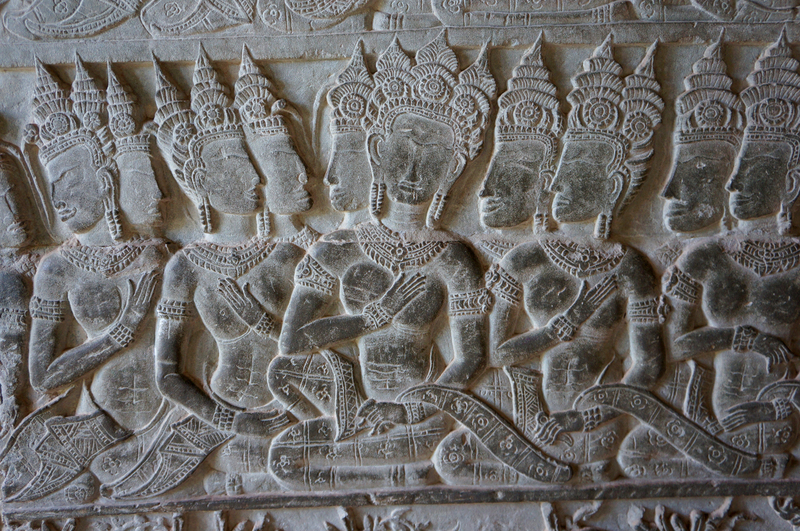 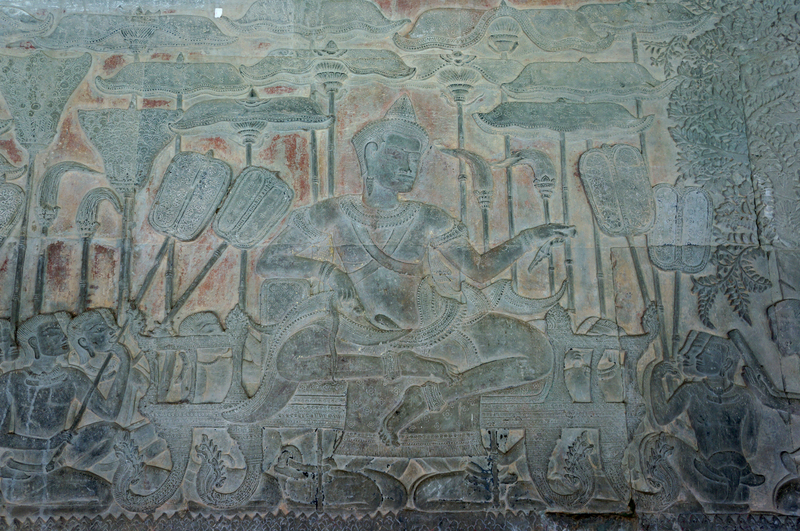 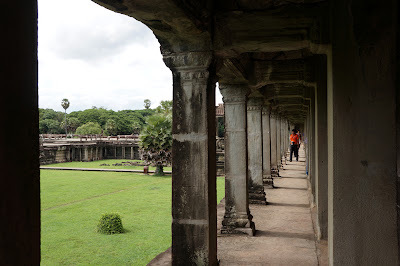 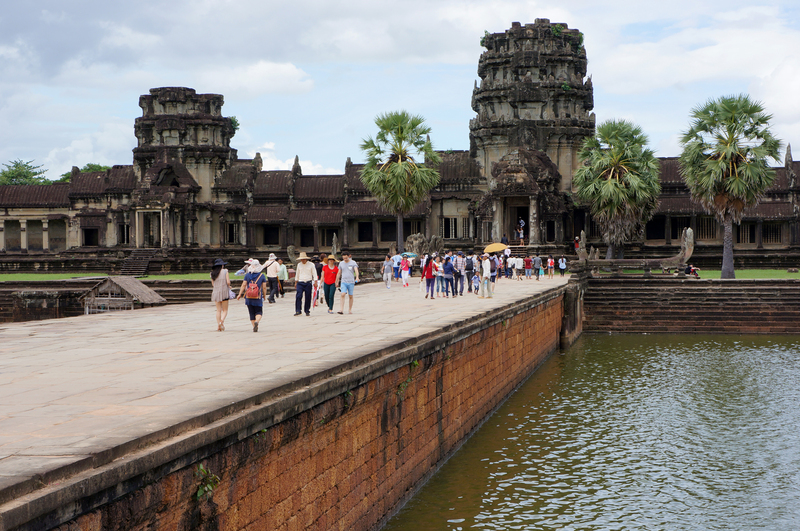 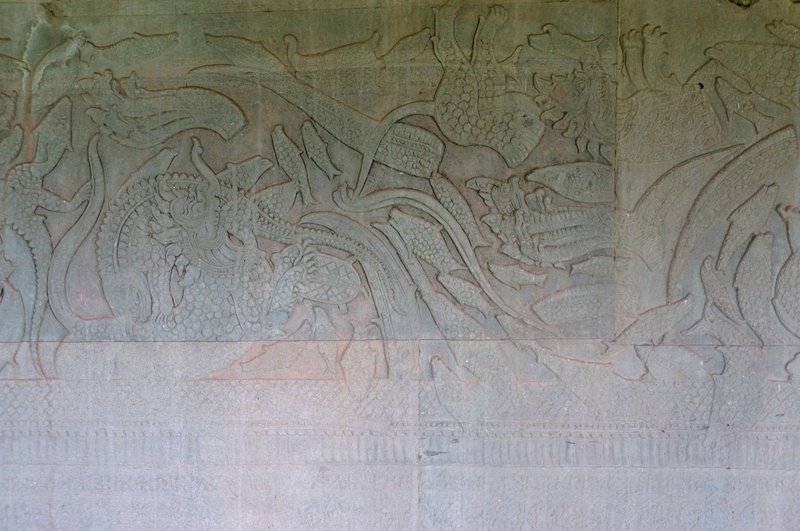 The perimeter wall of Angkor Wat is covered in carvings telling stories and legends. The walls were about 3 meters high and had to be at least 50 meters long on each size. 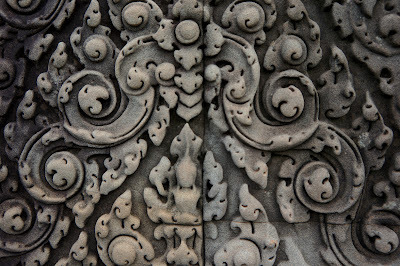 Breathtaking, the beauty and the amount of work that had gone into them. 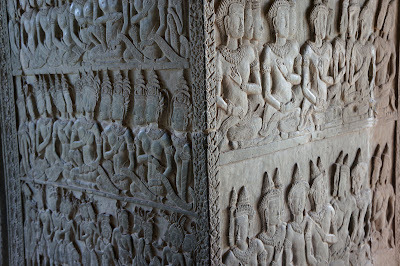 Above: one side of the wall, and the view back out from the temple. 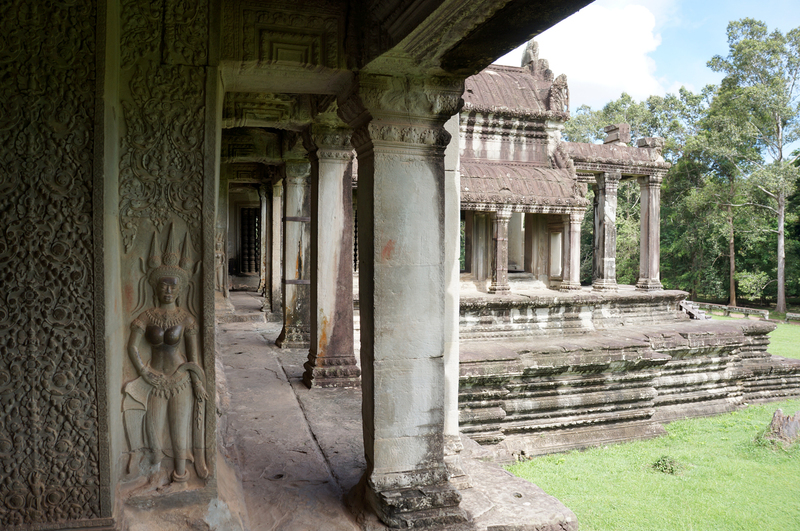 Back outside and wondering through the grounds. 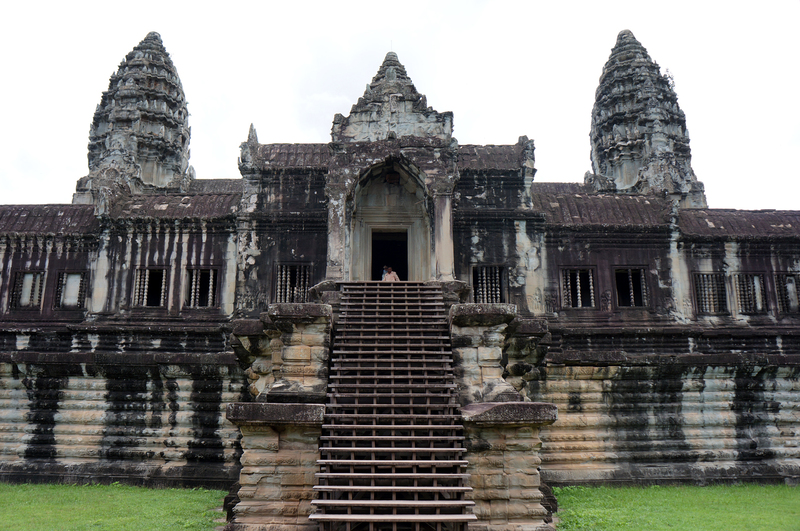 Up another level to take in an even greater view. There! 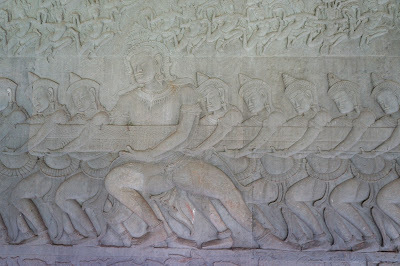 Three posts just to cover day one! 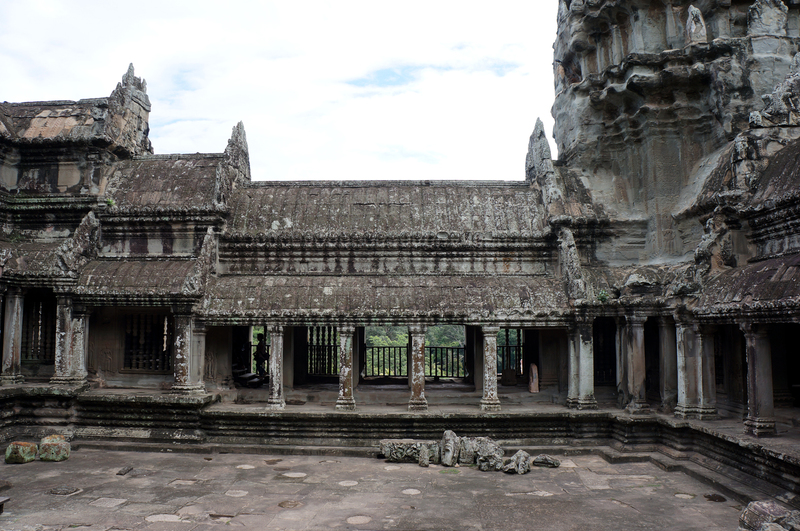 Not even, actually, as we had lunch and were back at the hotel early afternoon for a nap. 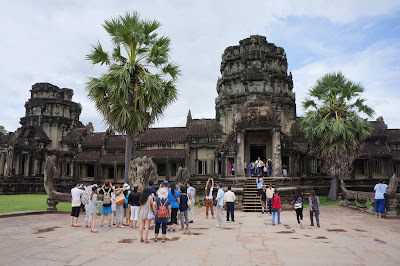 In the evening our guide took us to a local restaurant and we enjoyed a good local buffet dinner and saw a show of traditional music and dance which was great. 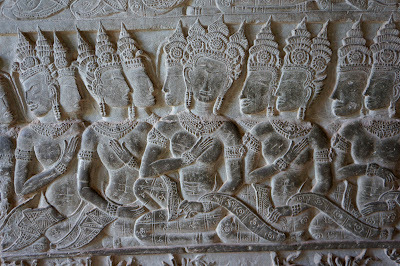 Then home to crash as the jet lag set in as we had an early start the following day.